With these yummy graham cracker sandwiches, filled with a fluffy mixture of strawberry yogurt and COOL WHIP, who needs the frozen treats aisle? Mix yogurt and whipped topping until well blended; spoon evenly onto 8 of the graham squares. Top each with second graham square to make sandwich; press together gently to secure. Place in shallow baking pan; cover with foil. Freeze 2 hours or until frozen. Transfer to airtight container. Store in freezer up to 2 weeks. 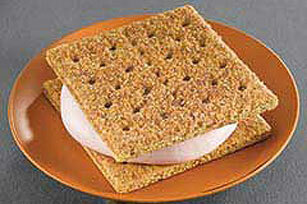 Prepare as directed, using blueberry nonfat yogurt and low-fat cinnamon graham crackers.